Most homeowners, especially those residing in older houses, can identify with the people charged with maintaining McGill’s buildings and infrastructure. For they often share a common tale of reno woe, the one where a seemingly minor task, like the plugging of a leak, the preparation for some cosmetic improvements, or even a routine house inspection as part of a sale, actually reveals big problems with complicated and expensive solutions. 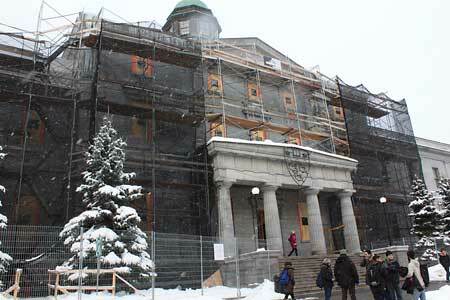 That’s essentially what happened in the summer of 2009 when the University hired contractors to wash years of accumulated grime from the main facade of McGill’s signature structure, the Arts Building. From 2009-2011, the Arts Building has undergone extensive renovations, including masonry repairs and the restoration of some 40 windows. Most homeowners, especially those residing in older houses, can identify with the people charged with maintaining McGill’s buildings and infrastructure. For they often share a common tale of reno woe, the one where a seemingly minor task, like the plugging of a leak, the preparation for some cosmetic improvements, or even a routine house inspection as part of a sale, actually reveals big problems with complicated and expensive solutions. That’s essentially what happened in the summer of 2009 when the University hired contractors to wash years of accumulated grime from the main facade of McGill’s signature structure, the Arts Building. The cleaning process, which was to be followed by minor masonry repairs and repointing as well as the restoration of 40 windows in the building, ended up revealing serious structural problems in the stonework around the round archway doors located in the wings on either side of the main entry door. The erosion of the mortar in the joints holding the wall together had allowed water to infiltrate them over time, and the subsequent freeze-thaw action caused the stone pilasters forming the archways to start separating from the main wall and lean outwards. Due to the danger of collapse, access to the doors had to be closed off, and work to rebuild the archways was organized. But the fun was only beginning, thanks in large part to the unusual construction of the Arts Building and its east (Dawson Hall) and west wings. “It’s one of the most imposing forms on campus, but it was not all built at the same time,” explained Robert Stanley, Director Project Management, Facilities Operations and Development (University Services). Indeed, while the main central block of the Arts Building and Dawson Hall were built from 1839-1843, the two side wings, in the form of one-storey facade walls, and the West Wing, were built in 1860. 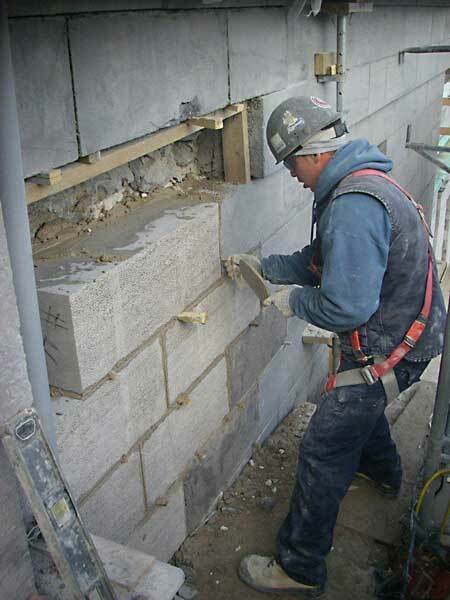 A mason works on the Arts Building in the fall of 2011. 1860 were not properly anchored to the building that was built behind them 23 years later. What’s more, the walls supporting the 1883 structure turned out to be made of rubble stone, without mortar, and were becoming unstable. “As a consequence we had to expand the scope of the renovation and take more time and spend more money than originally intended to consolidate the structure of the front walls of the building,” Stanley said. The work, with a final cost of approximately $5 million, was completed in December 2011. Throughout the project, Facilities Operations and Development staff and the engineers, architects and contractors they hired to carry out the work were determined to conserve as many original aspects of the building as possible, while using modern techniques and materials like stainless steel anchors, carbon-fibre mesh and custom mortars developed especially for the project to anchor the facade. They applied that same philosophy to the window repair project, choosing to restore rather than replace while still achieving modern standards of thermal comfort and functionality. The original windows, made of solid oak, had become warped and worn out, and were leaking air, sticking, and in some cases no longer closing. And some windowsills and mullions were rotten. Surprisingly, many of the glass panes and original brass fittings and weather stripping were still in good condition. The windows were removed and sent to a restoration shop where they were stripped down to the bare wood, repainted and recaulked. The original glass was reinstalled wherever possible, and all the original naval brass hardware was cleaned, polished and reused. Even the original lead weight mechanisms, used for opening and closing the windows, were repaired and reinstalled. As for the modernization, brass weatherstripping and new brick mold were added to improve the insulation while still allowing the facade to breathe. While the historical integrity of the Arts Building was top of mind throughout the three-year project, so too was the comfort and convenience of the building’s residents. Senior Project Manager Carlo Cimo and Assistant Project Manager Darryl Halickman worked in close collaboration with the Faculty of Arts to mitigate the negative consequences the project could have on normal University activities. Work by the contractors, for example, was halted during exam periods. That said, some adjacent spaces had to be vacated, some classes had to be relocated or cancelled, and staff who stayed in their offices on the south side during the work had to live without windows for several months. “Everyone was very helpful and understanding,” said Stanley, who estimates that only a third of the total scope of work on the Arts Building has been completed. Windows and doors still need to be restored on the West Wing, on Moyse Hall and on the north side of the building. McGillians haven’t seen the last of service trucks and scaffolding. The University expects to spend no less than $600 million ($100 million per year) on essential deferred maintenance over the next six years. The projects are scattered across both the downtown and Macdonald campus. • Redpath/ McLennan Library Terrace: the continuation of the second lot of the three-year project to rebuild the pedestrian terrace. • McLennan Library and Rutherford Physiocs Building: Replacement of cooling towers. • Burnside Hall: a major replacement and upgrade of ventilation air conditioning and electrical infrastructure. • MNI: roofing and masonry repairs. • Macdonald Stewart Library and Macdonald Engineering: slate and copper roof replacements. • Strathcona Anatomy & Dentistry: continuation of the fire protection upgrade. • Irving Ludmer Research and Training: a major renovation. • Davis House: Renovations to the foundations and basement spaces. • Duff Medical Building/MNI: the reconstruction of the service tunnel running under the building will start in the fall. • A new service building, to be built beginning this fall, on the bunker parking site adjacent to the Ferrier building, to house new standby-emergency power generators for the Powerhouse. Major interior renovations of teaching facilities in the McIntyre Medical Sciences building (second floor), and in the Bronfman building (fourth floor) are also scheduled to take place, as are renovations to teaching labs in Otto Maass.